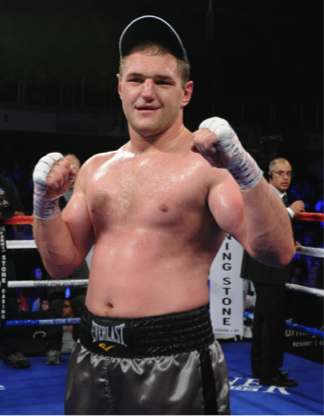 Andrey Fedosov (29-3, 24 KOs)–Fedosov is the most known and most experienced heavyweight from the 2015 Boxcino Championship Tournament on ESPN. Fedosov called for a rematch, but of course there was no chance of one, and the unbeaten Jennings moved on. Fedosov moved on as well – back to Russia, leaving Chicago after less than one year. His visa had expired, and he chose to remain and train in his native land. In his Boxcino quarterfinal matchup on February 20, 2015, Fedosov stopped Nate Heaven in the first round from Turning Stone Resort Casino in Verona, New York. In the Boxcino semifinals, Fedosov came off the canvas to stop Lenroy Thomas in a 3rd round stoppage at the Sands Casino Resort Bethlehem. Fedosov was dropped with a straight left hand in the first seconds of the fight. He came back to score a knockdown in round 3 that sent Thomas down for the 10 count. Fedosov won the 2015 Boxino Heavyweight Championship on May 22, 2015, when he stopped Donovan Dennis in the 8th round in Corona, California. Fedosov dropped Dennis 3 times before the bout was stopped a 54 seconds into round 8. In the process, Fedosov captured the WBO Inter-Continental Title, in addition to the 2015 Boxcino Heavyweight Title. In his last bout, Fedosov stopped Mario Heredia in 6 rounds at the Turning Stone Resort Casino. The bout, which was televised live on SHOWTIME EXTREME, saw Fedosov land hard shots on the 286 pound Heredia. He scored 3 knockdowns throughout the fight, and with the victory Fedosov won the WBA Federation championship.